You are here: Home / Sensory Play / What do I need for a sensory bin? 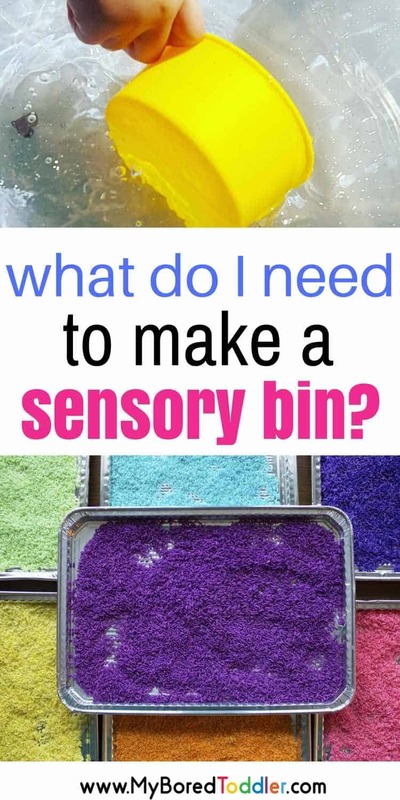 Have you ever wanted to make a sensory bin but were unsure of what you needed to get started? Some of the sensory bins on Pinterest can seem quite overwhelming but they don’t have to be. I often get asked, ‘What do I need for a sensory bin?’ so this guide should help you out! 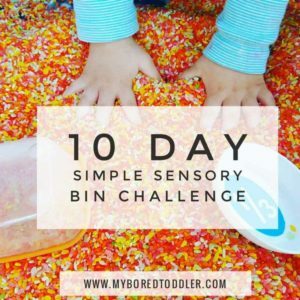 Thanks to everyone who is joining us for the 10 Day Simple Sensory Bin Challenge! If you haven’t already signed up you can join in HERE. A few of you have been asking what you need for the challenge so here it is! If you’ve stumbled on this post and are not part of the challenge you can still sign up HERE (it’s free) and you will get your first challenge tomorrow! I don’t want you to be rushing out to the shops each day, or even rushing out today and spending a lot of money. The idea of the challenge is to use what you already have as much as possible and each day I’ll offer different things you can substitute from around your home. The aim isn’t for us to all have the exact same sensory bin, but to create a sensory bin that is fun without spending a fortune! That being said, there are a few basic items that you will need to complete the challenge. Sensory bins are such a great hands on play based activity for toddlers and the opportunities are endless. They can be as simple as a container filled with water with a few cups or quite involved like these ones. Do I need to buy a special table or container? 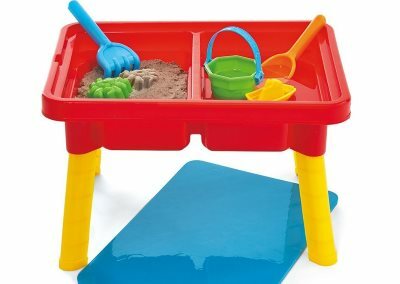 My two favorite ways to set up a sensory bin are in a simple sand and water table like this one . You can get similar ones from Amazon or Walmart. I know that Kmart and Big W sell them if you’re in Australia. 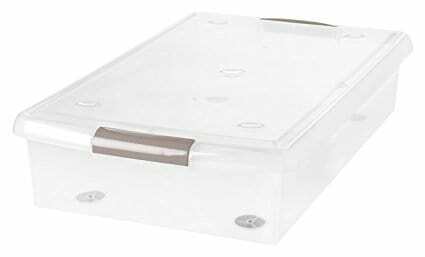 or in a large plastic container like this one. They both have their advantages and both will work fine. If you don’t have either of these, then look around your house for a large container that you can use instead. To be honest, the plastic container I’ve used for some of the challenges used to be full of craft supplies, so check if you have one around the house somewhere that you can re-purpose. What do I need for the sensory bin bases? By bases, I mean the main items we will be filling the bins with. We will rotate through these and use them more than once. If you don’t have or want to buy all of these, that’s OK. If we’re doing an activity with rice and you don’t have any, it will work with sand or pasta instead. We’re flexible! We will also be using food coloring and glitter (optional). These bases keep extremely well (except for the shaving cream) and once you’ve got them you can use them over and over again. Store them in an airtight container and you should only need to buy them once. During the challenge we will be offering the option of coloring the rice and pasta (not essential) and if you would like to do this you will also need zip lock bags, baking paper, white vinegar and food coloring. If you want to get a head start on coloring the pasta and rice you can find the details HERE (use the same method for the rice and the pasta). This is optional – plain rice and pasta works just as well! What ‘tools’ do I need for my sensory bins? Most of our activities will use items you already have at home, many from your kitchen. A good range of scoops, spoons, cups and measuring cups are always good. If you already have a play kitchen you’ll probably find many of the items there. I also add items from our beach play sets (buckets, shovels, rakes etc). If you are going to go and buy some items there are the ones I would recommend. The brands don’t matter – I normally go to our local dollar store and see what I can find in their kitchen department. You’ll probably have a lot of these at home. The items I would search out are a turkey baster if you can find one (always a favorite for water play) and a scoop of some kind. The other items are suggestions only! I hope you are all excited to get started! We’ll be starting with a water based activity so there’s no need to stress if you don’t have the other items. Make sure you check your email for your first challenge tomorrow!